Not an outdoors post at all, I’m afraid. Just something I felt like putting up on the blog. I wrote this last night, and scanned the documents this evening. After the Remembrance Sunday service I recalled that when one of my aunts died, quite a few years back, one of the personal effects that we kept from the house clearance was an old cigar box. Somehow it ended up in my sideboard, unopened and forgotten. But not quite forgotten. I vaguely remembered being shown some of its contents when I was about eight or nine, and thought some of them were souvenirs from WW2. So I dug out the box this evening and had a look inside. It was really quite an experience, especially as I have no clear idea what some of the mementos represent, and can only guess. On the top was a silk glove, an airman’s inner liner for his gauntlets, and several propaganda leaflets. Presumably these were souvenirs of missions over Germany, as some are labelled with the date and place they were dropped – “Kiel 18th May 1941”. The last leaflet is dated 9th July 1943, and purports to be a tract written by dissenting german students in Munich. Was this the airman’s last mission, or was he later delivering a more deadly cargo? Who was he? Did he survive? The keeping of these small souvenirs makes me suspect that he didn’t. Deeper down in the box are reminders of life at home in WW2. Ration books belonging to my grandfather and aunt – still in their Tate & Lyle ration book holder, which carries dire warnings about the threat of nationalisation of sugar. 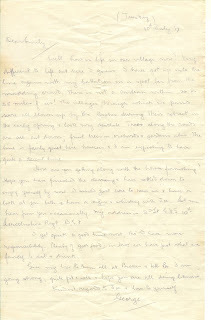 And then I found my Great Uncle George – or rather his letters and a couple of obituaries. 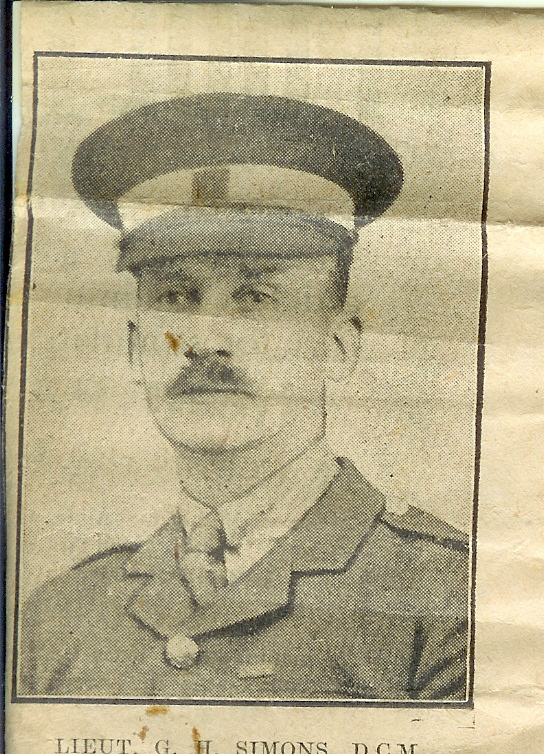 George Simons joined the 10 Lincolnshire Regiment in September 1914, and went on active service the following year. He was awarded the DCM in 1916. 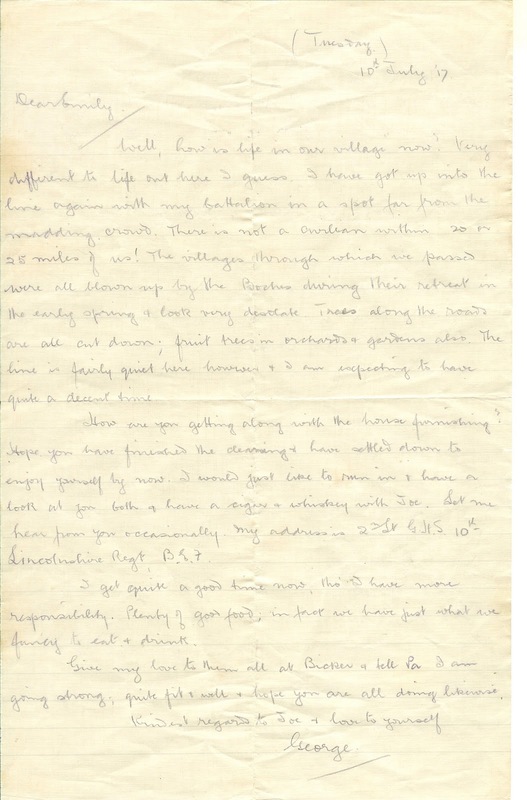 In the letter on the left, dated 10th July 1917, he says “…the line is fairly quiet here, however, and I am expecting to have quite a decent time”. He died less than 7 weeks later. 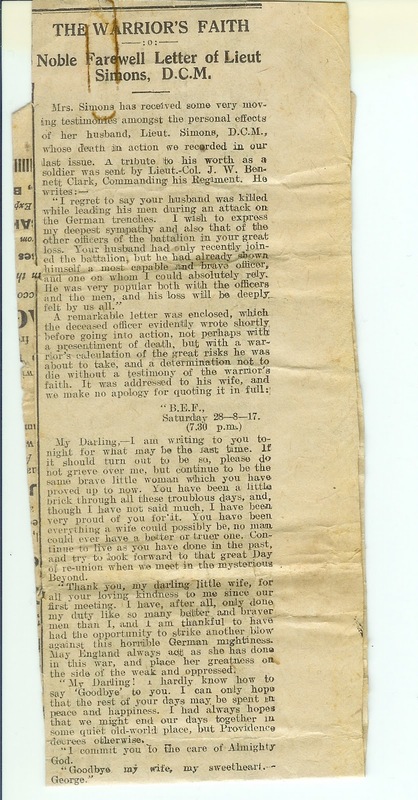 His last letter (written to his wife on the eve of the attack) is dated August 25th 1917 at 7.30pm is quoted in full in the newspaper clipping. He was killed in action the following morning. To see the text in more detail, just click on the pictures for a larger view - most browsers will then allow you to click on the image to zoom to full size, and the text will be perfectly legible. Touching these objects, the stained glove, the letters, somehow transforms names into real people. George Simons, an official with the Post Office aged thirty in 1914 enlisted with thousands of others. The unknown airman was one of thousands too. The objects that I discovered are small things - tiny fragments of lives long gone. I've returned them to the cigar box now, but I hope that sometime in the future someone else will open the old box and make the same discoveries.